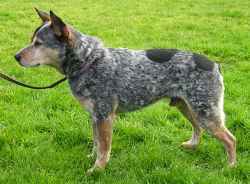 The Australian Cattle Dog, also known as the Queensland Heeler or Blue Heeler, is a herding dog developed in Australia for handling cattle. It is a medium-sized dog with a lot of energy and an independent streak. The Australian Cattle Dog is a courageous and intelligent working dog with strength and endurance unlike any other dog of its size. Renowned for their protectiveness and loyalty to master and property, they are very selective as to who are friend of foe. Originated in the early colonial days in Australia when limited labour was available to Sheppard and herd cattle. The dog is a cross between a Smithfield and the native Dingo, although further breeding with Collies has further evolved the breed . It was not until 1893 that a breed standard was defined by Robert Kaleski which was finally approved and adopted by the Australian National Kennel Council in 1963.